le chaudron de vulcain – September 14 , 2018. EN. Kuril Islands : Sarychev Peak , Japan : Ioto / Iwo – Jima , Chile , Nevados de Chillan , Italy / Sicily : Etna . Home / blog georges Vitton / September 14 , 2018. EN. Kuril Islands : Sarychev Peak , Japan : Ioto / Iwo – Jima , Chile , Nevados de Chillan , Italy / Sicily : Etna . Issued: September 12 , 2018 . 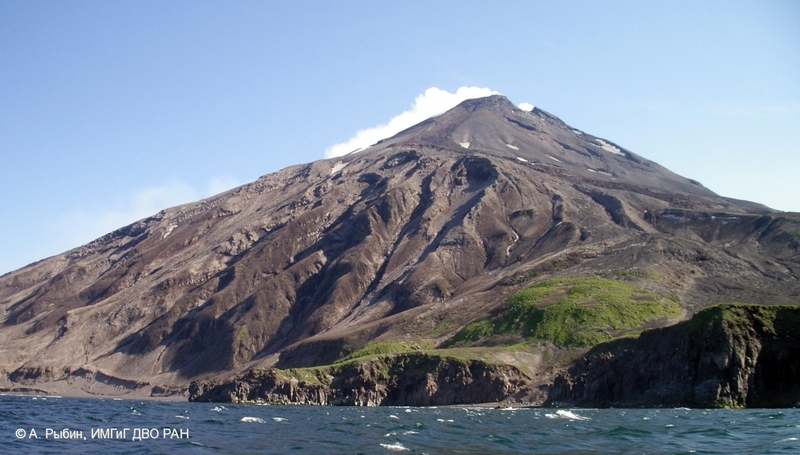 Activity of the volcano Sarychev Peak increased. According to visual data from Matua Island, explosions sent ash up to 3-4 km a.s.l. at 19:03 UTC on 12 September. An ash cloud drifted to the south-east from the volcano. At 21:00 UTC an ash cloud 5.5×6 km in size moved for about 121 km to the south-east from the volcano. Later the ash cloud was not observed. Activity of the volcano increased. Strong ash explosions could occur at any time. A thermal anomaly over the volcano is noting sometimes from 07 May, 2018. Last moderate ash explosion of the volcano Sarychev Peak occurred on 11 August 2018. 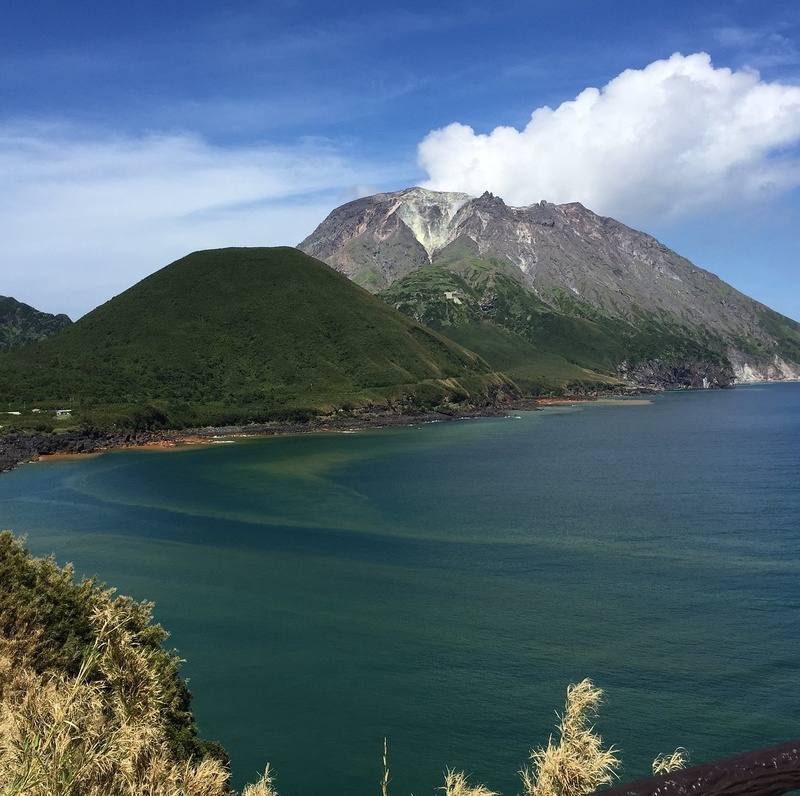 Undersea eruption detected at Japan’s Iwo Jima. Aerial photos taken by navy aircraft earlier Wednesday showed seawater shooting as high as 10 meters (33 feet) above the surface just off the island’s southern coast, the Japan Meteorological Agency said. 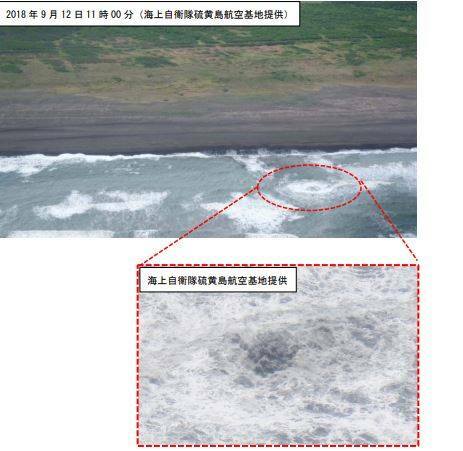 According to the Iwo Jima air base of the Maritime Self-Defense Force, this morning’s aerial observation confirmed that the seawater was 5 to 10 m above sea level on the south side. Iwo Jima. It is estimated that an eruption on the seabed has occurred. Volcanic earthquakes continue, the earthquake that occurred around 8 pm on the 11th continues and volcanic activity continues to be important. On Iwo Jima, volcanic earthquakes have increased since 2 September, at about 0200 hours, and seismic activity gradually declined with peaks on 8 September, but many volcanic earthquakes continued to occur. The volcanic tremor continued around 8 pm on September 11th. In continuous observation, a large uplift was observed from the same period as the seismic activity and it continues to occur. Volcanic activity is still active. Since it is possible that an eruption will occur in the future, please remain alert to the eruption in the area of the coast. 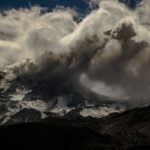 The National Geological and Mining Service (SERNAGEOMIN), responsible for the National Volcanic Monitoring Network Chile (RNVV) and the Volcanological Observatory of the Southern Andes (OVDAS), said Wednesday, September 12, that an explosion took place in inside a crater of the volcanic complex Nevados de Chillán. 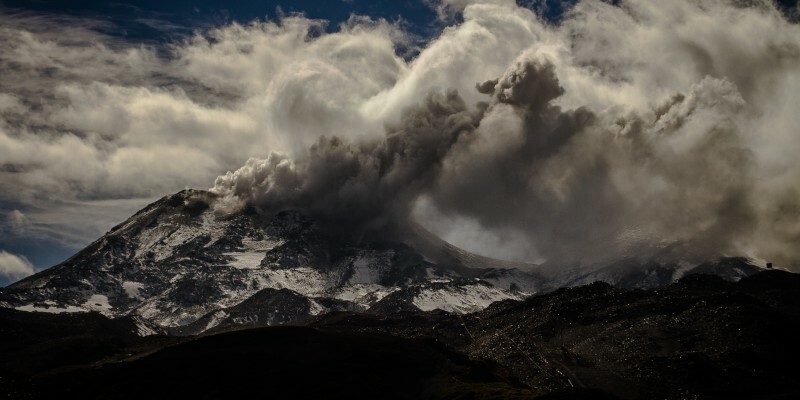 According to the special report of volcanic activity (REAV), the monitoring stations recorded an explosion associated with the partial destruction of the dome by pressurization of the volcanic system, the massif located in the Región de Ñuble. In this regard, the national director of SERNAGEOMIN, Mario Pereira, said that the Nevados de Chillán remained in orange technical alert and that the episode occurred of a lower energy intensity than that of mid-July. « The height of the column of pyroclastic material is estimated at about 700 meters and the material fell around the crater in an estimated radius of 400 meters northeast to the Gato River. Pereira added that surveillance is maintained on Nevados de Chillán, where more than 24 surveillance teams are spread over 11 stations. « Our specialists have the appropriate technologies to monitor volcanic activity and we deliver them to other institutions in a timely manner so that they have technical information on what is happening, including the map of areas of potential impact. « , did he declare. 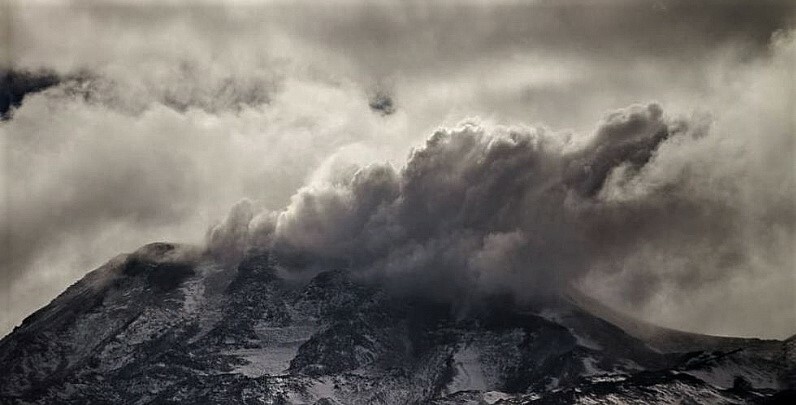 Nevados de Chillán remains on orange alert since April 5, 2018 and in July, three explosions destroyed part of the dome. The volcanic complex has an elliptical shape, with a rock composition varying between dacitic and andesitic. It is located in the Andean mountain range of the Ñuble region, on the border of the communes of Coihueco and Pinto. Since December 31, 2015, when the yellow alert was raised, the massif showed instability in its internal dynamics, which indicates a condition outside of its base level. Parameters derived from seismicity and observed surface activity, namely pulsatile minor explosions, thermal anomalies and degassing, continue. On Thursday, September 13th, 2018 at 22:18 local time (01:18 UTC), the monitoring stations installed near the Nevados volcano of Chillan recorded an earthquake associated with an explosion inside the active crater. The earthquake associated with the explosion was recorded with a seismic signal having a significantly reduced displacement value (seismic energy). 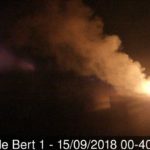 In addition to the IP camera installed by the OVDAS, it was possible to observe a strong incandescence, gases, and important hot particulate material falling on the surroundings of the active crater and the surrounding areas, especially towards North and North-East. . This episode allows to deduce by its characteristics the partial destruction of the dome. 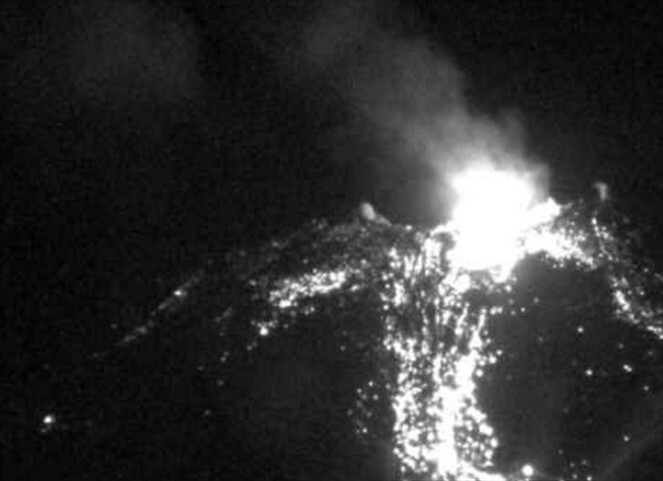 Etna: The explosions continue, a loud roar shortly after 10 am on September 13th. The moderate eruption of the Sicilian volcano continues, characterized above all by explosions of ash and gas from the summit, which follow each other at irregular intervals. 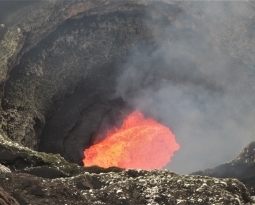 This morning, there have already been several explosions, one particularly intense and noisy, around 10:05 am from the Southeast crater. 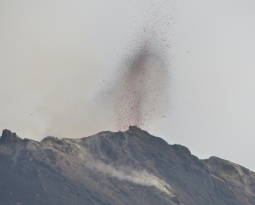 The roar was clearly felt in the volcano area and in the villages on the slopes of Mount Etna. The explosion caused the release of ash and smoke, clearly visible thanks to the weather conditions.